This centuries-old city has been declared a World Heritage Site by UNESCO. Countless churches and palaces bear witness to the power and unsurpassed wealth of this small republic. The lagoon city was founded in northern Italy during the troubled times of the decline of the Roman Empire. The remains of the evangelist Mark were transferred to Venice in 829. The streams of pilgrims that followed gave the city much added importance. Since then the sacred symbol of the lion has been the city's coat of arms. Venetian troops later occupied eastern Italy and, in 1204, even Constantinople. 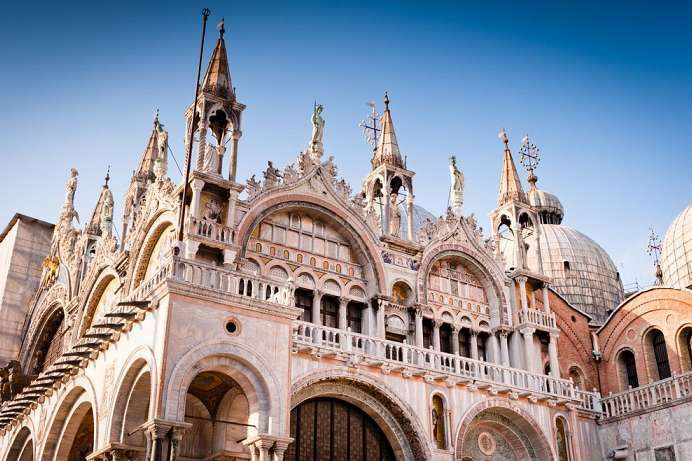 At the height of its power Venice ruled the Mediterranean. The demise of the “serrenissima repubblica” began with the fall of Constantinople and the opening of the Western Hemisphere by Spain, Portugal and Holland. Venice's political importance declined after the Congress of Vienna and it was given to Austria. 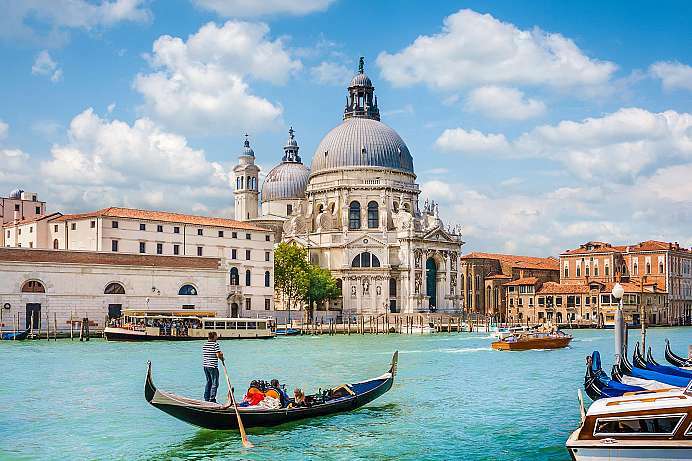 Returned to Italy in 1866, Venice has inspired generations of artists, writers and musicians. More than a city, it is a symbol of wealth and beauty as well as death and decay. The splendour of this 1000 year old church is stunning and enchanting. With five domes and decorated arches and windows, it is the result of numerous extensions and conversions. Its core is still the building erected in the 11th century above the floor plan of a Greek cross. Here also lie the bones of the Evangelist Mark, the city's relic that gives it its identity. The books about the shrine fill entire libraries. The cathedral treasury contains the richest Byzantine gold and silver treasure in the world. Most of it comes from Constantinople, which was plundered by the Venetians in 1204. The Museo Marciano has found its place in the gallery above the vestibule. 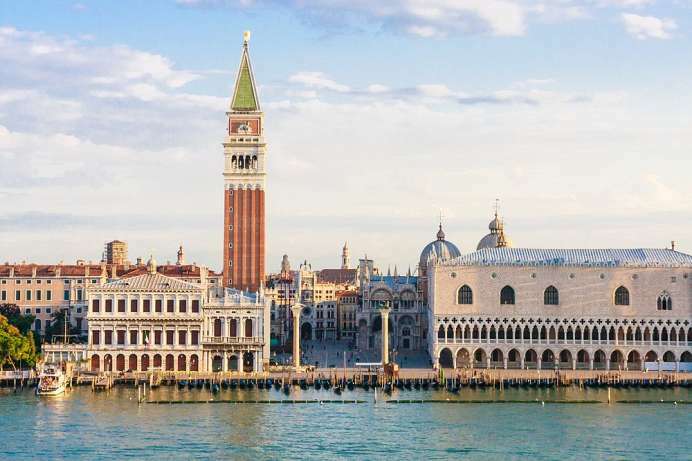 A lift takes you up to the belfry of San Marco and on to the viewing platform with a panoramic view of a sea of gables and shingles interspersed with dozens of towers. 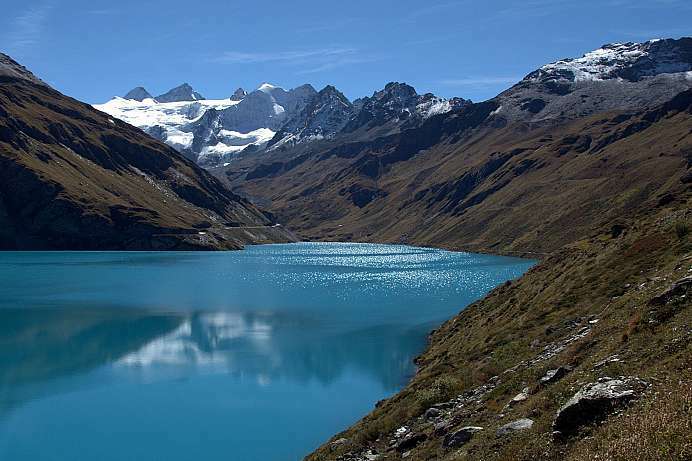 The visit of the tower is recommended at the very beginning; because the panorama provides a first, helpful overall orientation and a feeling for the unique location and structure of the lagoon city. Originally built in the 10th century and considerably raised in the 12th, the almost 100-metre-high Campanile collapsed in 1902, but was immediately rebuilt from the original material. Bacaro – the name is derived from the wine god Bacchus – is the name given to the simple taverns in Venice. There are few chairs, but a long bar and a large selection of wines with a few snacks. Do Mori not far from the fish market is the oldest Bacaro of Venice and already over 500 years old. 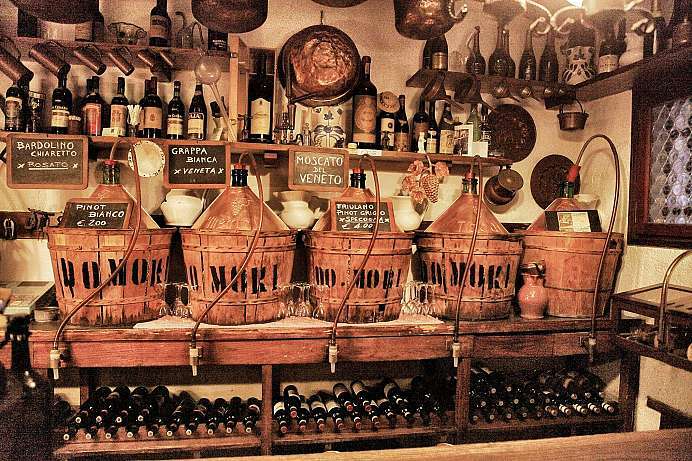 Countless pots and copper kettles hang from the ceiling, more than 100 excellent wines await you in the bar. There are also many different tramezzini. 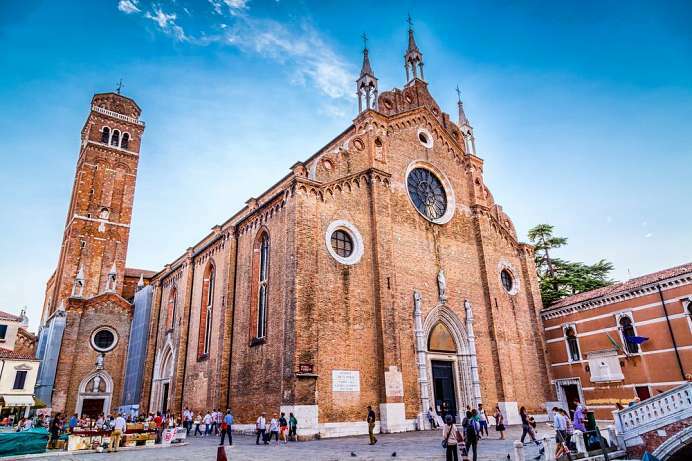 The Santa Maria Gloriosa dei Frari is the great Gothic Franciscan church of the city. On the outside it is modest and simple, as is the mendicant order itself. Inside, however, it documents the power and wealth to which the disciples of Saint Francis have come. The Frari turns out to be an art shrine of the very first order. The tomb pyramid of the sculptor Antonio Canova immediately catches the eye in the enormous nave. Opposite is the tomb of Titian with his Pesaro Madonna. Precious altar leaves by Bartolomeo Vivarini and Giovanni Bellini hang in the choir chapels. A sculpture of St. John by Donatello stands where the composer Claudio Monteverdi is buried. Everything, however, is surpassed by Assunta, the sky-driving Mary, who floats freely above the high altar. Titian created it and, at the end of the Renaissance, already anticipated the Baroque era with it. 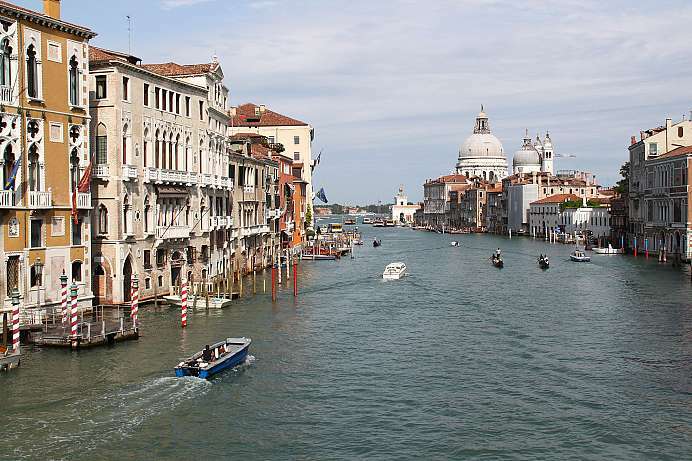 Music from Venice has been an integral part of European cultural history since the 16th century. Monteverdi and Vivaldi are the most famous names. The Venetian multiple choir gave decisive impulses for innovations in vocal and instrumental music. 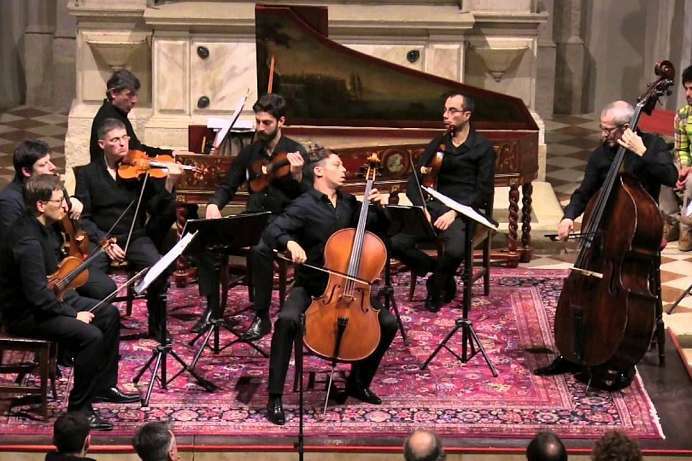 Under the name “Violins in Venice” the chamber music ensemble Interpreti Veneziani gives concerts more than 200 days a year. They take place in the former church San Vidal. In addition to Venetian music, the programme also includes works by Bach. 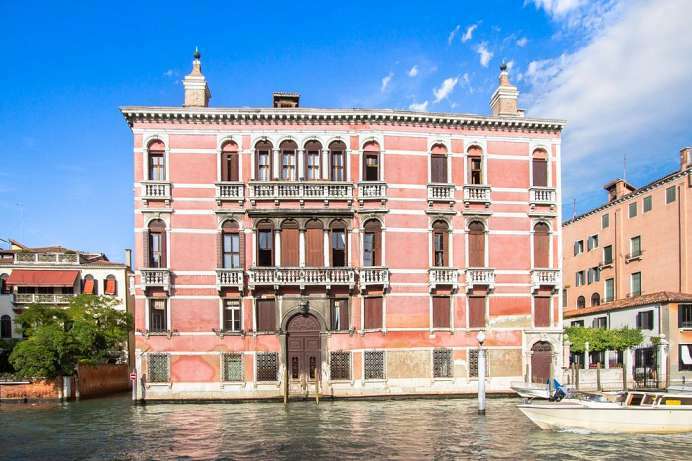 The massive Casa Rezzonico, built by Baldassare Longhena and Giorgio Massari, is a special jewel of Renaissance architecture even by Venetian standards. In the 18th century it belonged for a time to Carlo Rezzonico, who later wrote history as Pope Clement XIII. Today the building houses the Museo del Settecento Veneziano, which impressively documents the opulent lifestyle of the aristocracy at the end of the Republic. This “18th century museum” extends over all three floors and, with furniture and decorative pieces, pictures and ceiling paintings, reflects the life of the aristocracy of that heyday. It's the Palace of Palaces. 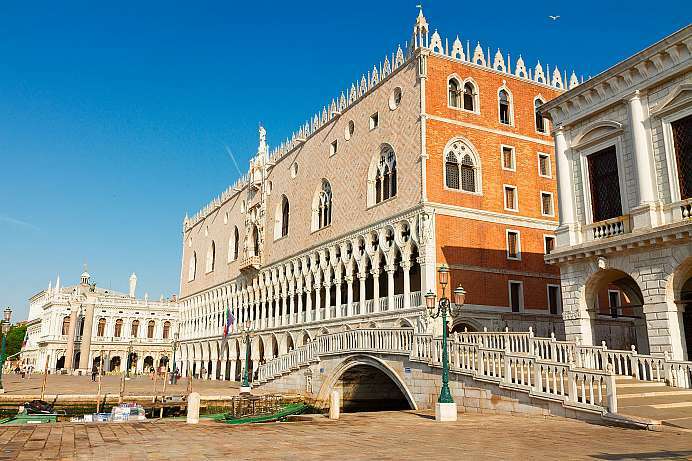 The Doge's Palace was the power centre of politics, the highest symbol of Venetian civilization and an eye-catcher on all representations of Venice. 120 Doge's have guided the fate of the maritime republic from here for almost 1000 years. In its present Gothic form, it was created in the 14th and early 15th centuries. Its lower façade is colossal: covered in marble and structured by countless columns and arches. In between there are sculptures of Adam and Eve or the drunken Noah. The tour through the interior of the Doge's Palace is overwhelming. It begins opposite the Loggetta and the Campanile at its high Gothic main portal, the Porta della Carta. On the now following path through the palace one encounters “miracle upon miracle”, as the French statesman François de Chateaubriand, blinded by so much splendour, raved. Napoleon once called it the “most beautiful salon in the world”, which has not changed much until today. 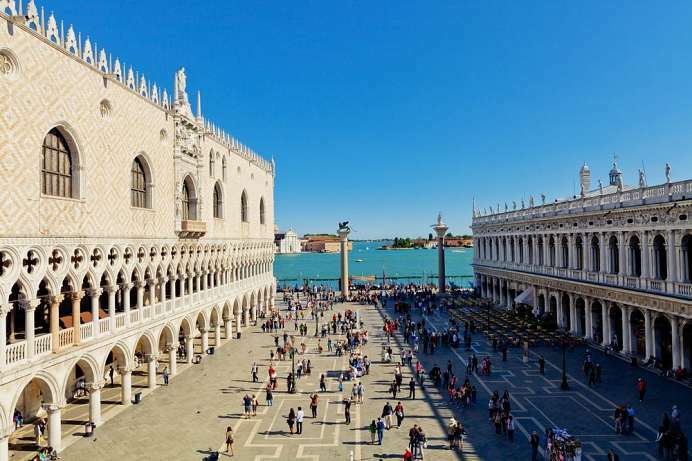 The 175 metre long, slightly trapezoidal Piazza San Marco offers a variety of moods. At every time of day and season it appears different and new. It was the scene of processions and secular festivals. It is a meeting place and stage of vanity for locals and tourists. Only on foggy winter days or very late at night is it deserted. Then it turns into a magical backdrop. Important buildings line the 800-year-old square. Under the arcades there is space for luxury shops and noble restaurants. More than 400 bridges cross about 150 canals and connect 100 islands. Some are nameless or inconspicuous. Some are of particular importance from a traffic or cultural-historical point of view. 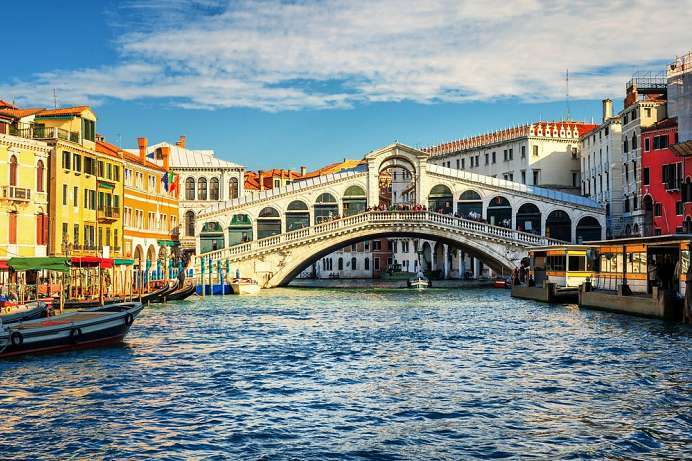 The Rialto Bridge, which has connected the districts of San Marco and San Polo since the 16th century, is world-famous and most frequently photographed. Business flourished here for many centuries: merchants and seafarers unloaded their goods at the quay behind which the banks and trading houses were located. Bridge architect was a certain Antonio da Ponte, who was able to assert himself against star architect Michelangelo with his practical design because he left enough space for shipping traffic.